I have spent most of the last three days working long hours on a rush commission and I can’t put it up yet, so here is a little wildlife info from the home front. The insect population seems to have taken as big a hit this summer as the foliage and larger animals. With fewer flowers blooming and the all around dryness I haven’t seen much of anything moving around in the flower beds. Lately, with the good rains we had in the last couple of weeks, we have had a small resurgence in the foliage. 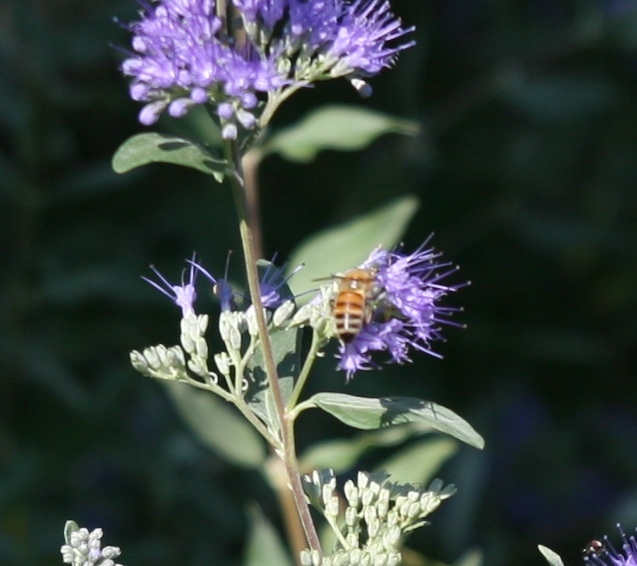 Both the butterfly bush and the bluebeard have bloomed profusely and I am starting to see the return of some visitors. I love both of these shrubs. 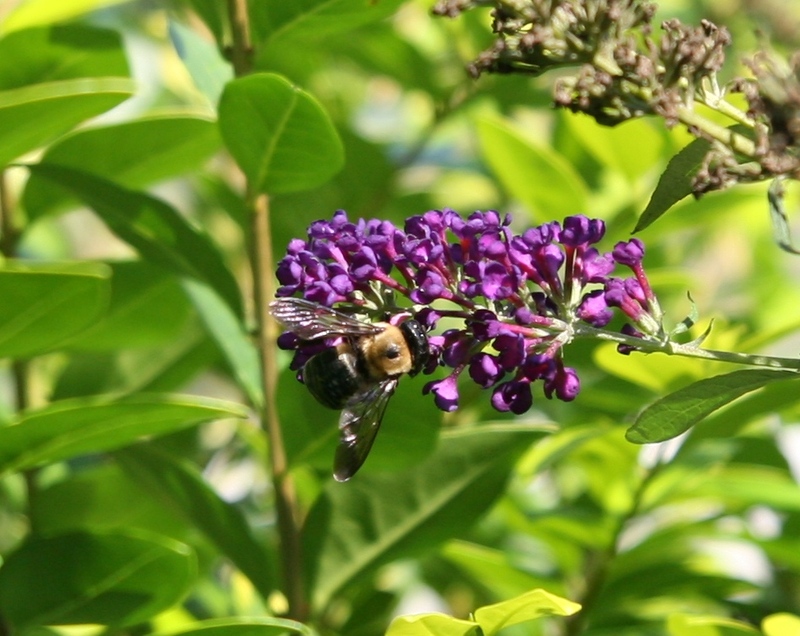 The color of the butterfly bush is an iridescent purple that shimmers in the sunlight. The blue beard carries a profusion of purpley/blue flower clusters as a late summer floral feature. It can grow up to 4-5′ if it is not trimmed back but can be held to a smaller height if needed with a yearly whacking. I let the ones in the back under our gazebo grow as wild as they want and trim the front ones in the spring. Surprisingly, buzzing along with the ubiquitous bumble bees, I think I am seeing some honey bees at last. It has been many years since I have seen any at all, due to the honey bee die off, but I think these might be the real thing. I first saw them when the sage bloomed a month early in April and now I seeing them again on both shrubs. The air is pleasantly alive the apian sounds. The humming is incredibly loud and they don’t seem to mind when I brush around them. I have never been stung. I think they are drunk on the nectar. I have also seen several hummingbirds at the butterfly bush, the balloon flowers, and the spirea. I tried to get a photo but they are so quick and they never stay long enough that I can get there in time with the camera. I am glad to see that they are living through this difficult summer too. And let’s not forget the butterflies either. The flowers have been welcoming to all. 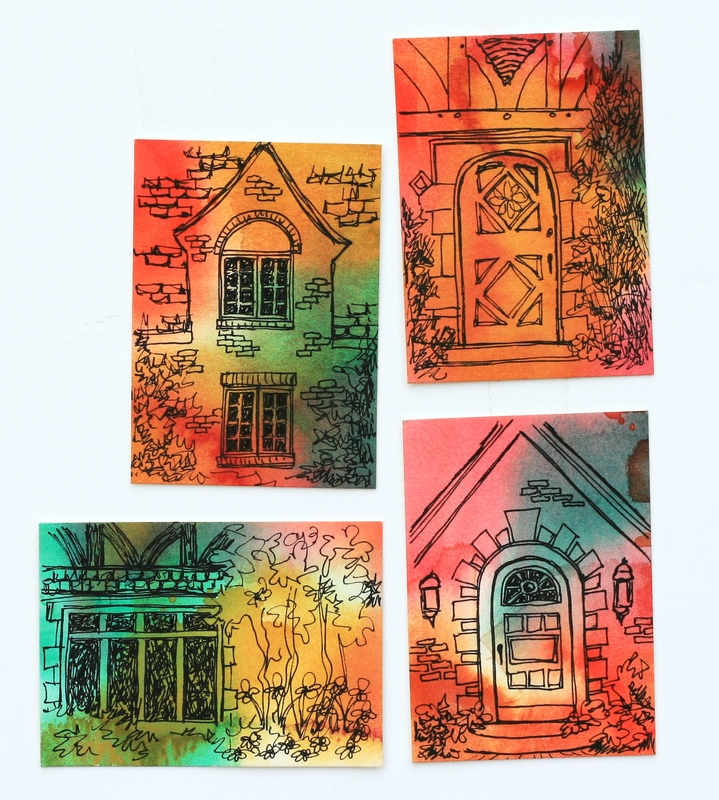 I couldn’t decide on what to do next so I ended up having a little bit of fun with some of my watercolor aceo blanks. I feel in a bit of a rut right now and sometimes just playing around with something small helps get me going again. The last time I looked at these, I didn’t feel like the colors were inspirationally floral so they have sat around the studio for ages. I pulled them out and decided to use some of the home photos to put some quick sketches on them, kind of in the spirit of the abstract architecturals. The last time I tried it, they turned out – badly, but I think these turned out all right. As I look at them I am thinking I should have flipped the horizontal one around so that the green was in the foliage and the gold was around the windows. I wasn’t much for the planning on these though. The idea was just to put some ink down and get going. I have worked on the pastel coloring of the window scape for the last few days. I over did the spray fixative on the last one a bit and have had a hard time getting a good photo of it due to glare created by the gloss sheen, so I held back on the spray this time. It made it little slower going as I tried to lay most of the pastels before a preliminary spray, but I think it was worth while. My brain has gotten a little confused with all of the watercolor work but I’m getting back to normal. It was a little bit different not have the door as a focal point but I think that the window array turned out to be satisfactory. The crazy brick pattern that I didn’t do as well as I wanted has receded somewhat with the color. I am debating deepening the timber color, but it is actually a bit richer in the actual pastel. There was a lot more landscaping since there was no stoop or sidewalk to be concerned with and I decided to go ahead with trees in the background. I just felt that the blue sky was not the effect that I wanted and so I wrapped the house with the foliage. 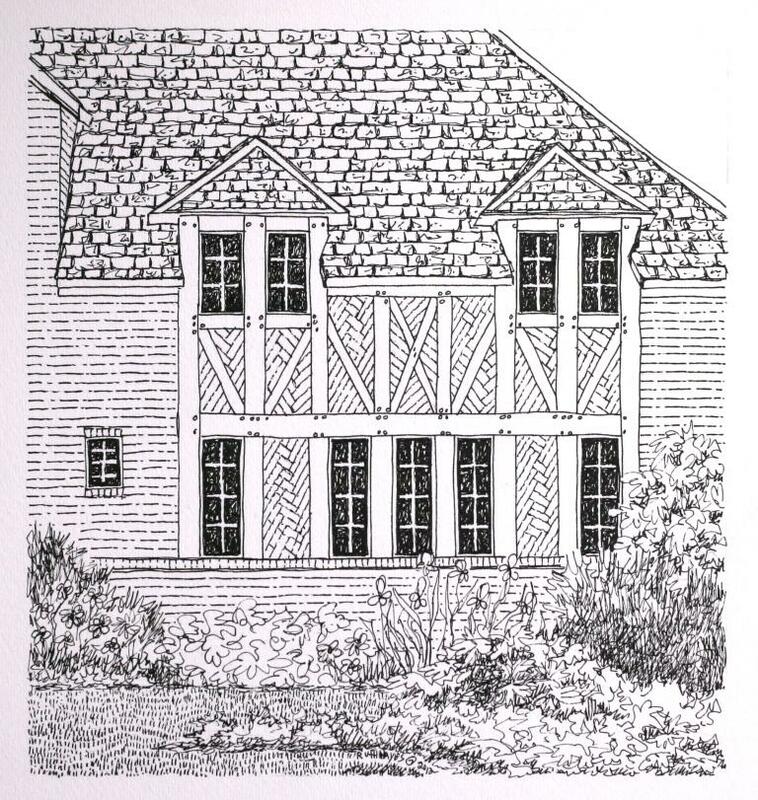 The windows would have been too symmetrical without the slice of gable on the upper left, so I am glad I left it in. 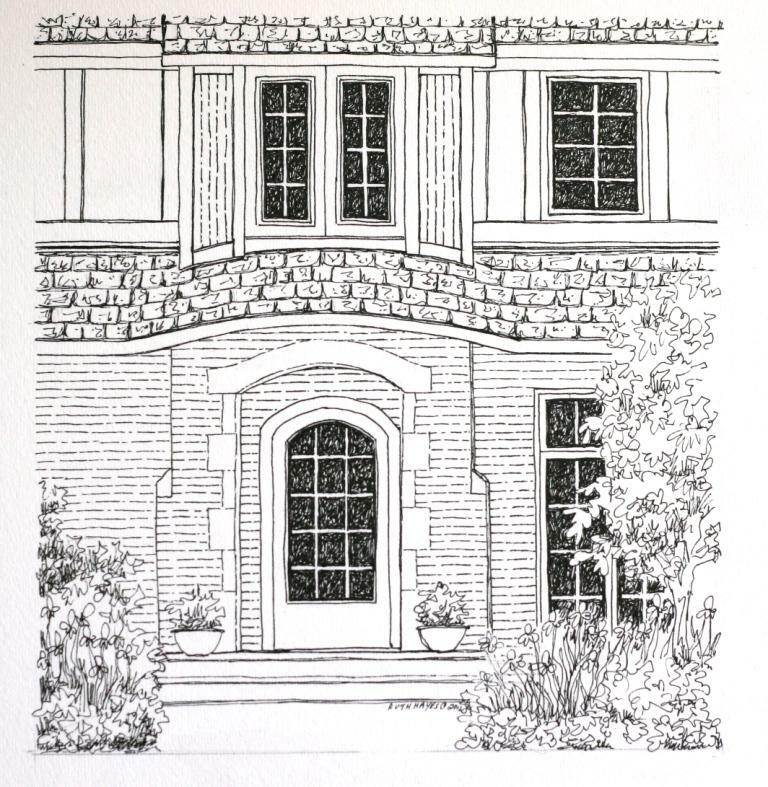 I set out to ink the window scape the last two days and have pretty much finished it. 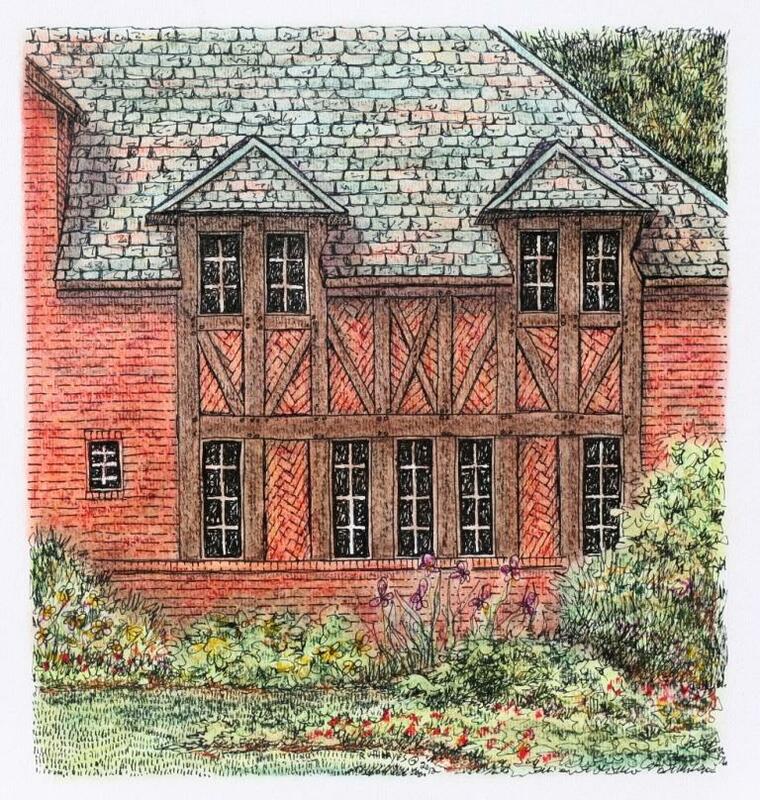 I decided to leave the hint of another gable in at the upper left to keep some visual interest there and unbalance the symmetry of the windows a bit. Looking at it now, I may also put in some trees in the upper right instead of leaving it as sky. The photo shows some spindly pines behind the house which are not unattractive, but is not a decision that I have to make just yet. I might just have the pines AND the sky. I’ll probably decide after I have colored in the landscaping and see if I want to put some greens there too. I don’t particularly like the way I did the crazy brick in this one, but it probably will be a little bit less noticeable after the color is on. We finally got some much needed rain over several hours Thursday evening. The rain gauge said 2 3/4″ but it probably was more given that some of the rain was horizontal. I think that single rainstorm gave us more than we have gotten since the beginning of April. The plants and animals are loving it. My vinca has greened back up and hopefully more will now make it through the fall and winter. The crepe myrtle has bloomed profusely in the space of a few days, as has the butterfly bush and the bluebeard. And the butterfly population seems to have risen. Now when I look out of the window, I often see half a dozen of various types. Not as much as I normally would, but a lot more than I have been seeing. We still see the fawns and does drinking and eating down by the lake, but as of yet, no bucks. I would think that their antlers fairly good size by now. And the young red-tailed hawk is still out there making his presence known. I swear every time I go outside, he is screeching his head off somewhere close – across the lake, next to the house, or soaring across the sky. It’s a wonder he doesn’t have laryngitis by now. I haven’t the faintest idea what he is calling for. He left the nest some time ago so I don’t think he is calling for mom or dad at this point. I worked on the last pastel for a few hours and touched up the shadows. It doesn’t look radically different, so I have moved on to the next drawing. For a change, but staying within an architectural theme, I selected a picture that was mostly windows and had no doors. I liked the upper windows and all of the timber work. Once again the brick mason was having fun and you will see some angles when I lay down the inking. 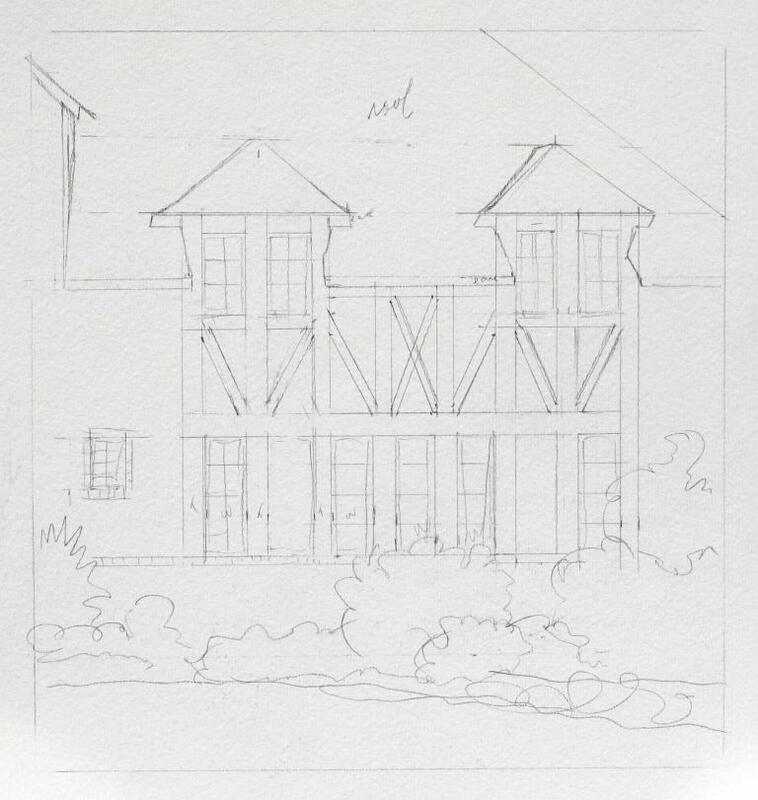 I may or may not keep the dormer on the upper left but I probably won’t decide until I see how the inking lays out. Sometimes I don’t make those kinds of decisions until I get half way through. I just have to remember to leave it uninked for a while. That is not always easy when I am in the midst of working, just as I sometimes forget where the edges are. It was kind of fun getting back to some of my more traditional work. It was odd though because I had to have a slight brain shift from the abstract architecturals and the watercolor/ink animals to the pastel work. I actually had to think about what I was doing when I started to lay on the color, envisioning the changes of the pastel with the fixatives compared to the watercolor just being what it was. In general I think this went well. Tomorrow I will put a little bit more shadow under the entryway recess and under the eave. They don’t seem dark enough yet and it sometimes hard to tell how much the pastels will alter with the fixative. Also, the brickwork is a bit too even, so I may play with that. I like to take 2 days with these anyway. For some reason I can think it all looks great after the first spray and then the next day I will see all of the flaws. I have decided to come back to the architecturals for a while. I feel refreshed from the recent abstracts and animal art and have decided to work on a few of the more traditional pieces. I will probably make a companion pastel as I cut up a larger board for this and have some matching blanks. For some reason I had a hard time with the pencil up of this drawing. Even though it is only about 8″x 8″, it took me two afternoons to lay it out. I could not get the entryway balanced, mostly because my vision was not co-operating and refused to focus on the small details. Maybe it is time for a stronger pair of reading glasses over my contacts. The pen and ink went a lot faster, perhaps because the sharper lines were easier to focus on. I am somewhat pleased with how it has turned out. You can’t tell from the drawing yet, but the doorway is recessed in an alcove created by the entryway bumpout. This should be easy to show when I add the pastels tomorrow. I should be able to do most of the color in one day and touch up the next. 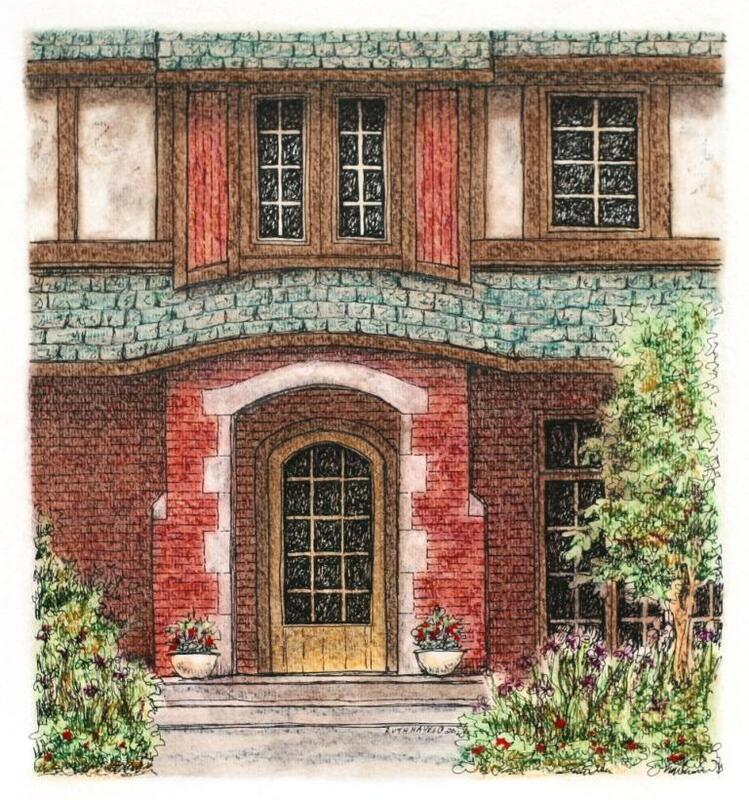 I like the curved roof over the doorway and the arched lintel. The circle top doorway mirrors the other architectural details in a pleasing way too. I will have to balance the window blacks somehow on the left side, but I am not sure what I’ll do until I start the color. I am a little concerned that I cut the top roof line off too short but perhaps it will be better after the color is added.